“How heavy’s your pack? Do you have waterproofs? You had any trouble? – I’m a nosy bugger ain’t I!” Ian Bell holding up a photo by another coast walker Charles Compton. Ian, whose father was a shepherd spent his life working on the roads. He also met coast walker Natalia Spencer and Helen Krasner. West Loch Tarbert, Argyll & Bute, Scotland. Milepost, West Loch Tarbert, Argyll & Bute, Scotland. Exhausted shed I, Ardpatrick, Argyll & Bute, Scotland. The Paps of Jura from Ardpatrick Point, Argyll & Bute, Scotland. Exhausted shed II, Ardpatrick, Argyll & Bute, Scotland. Bothy at Ardpatrick Point I, Argyll & Bute, Scotland. Bothy at Ardpatrick Point II, Argyll & Bute, Scotland. Bothy at Ardpatrick Point III, Argyll & Bute, Scotland. Bothy at Ardpatrick Point IV, Argyll & Bute, Scotland. Heather, Ardpatrick Point, Argyll & Bute, Scotland. Rest day at the West Loch Hotel Part 1: Exceptionally delicious Scottish breakfast consisting of Lorne Sausage, McSween Haggis, Stornoway Black Pudding, Potato Scone, Fried Egg and Grilled Tomato. Rest day at the West Loch Hotel Part 2: Fixing my leaking thermarest, the past few days I’d woken up on the ground due to a slow puncture, the first in over 4,000 miles of use. Rest day at the West Loch Hotel Part 3: Very satisfied with my weight saving OCD label trimming! Ian Bell’s 1988 copy of the Guinness Book of Records which includes a photo of record breaking walker Helen Krasner with his nieces in front of his cottage. The Kintyre Peninsula is now completed. 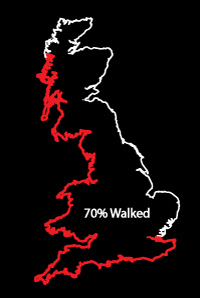 The route ahead will be almost entirely wild camping until I reach Oban. Wisdom of the bothy book at Ardpatrick Point. This one almost looks clean enough to use! Like walking in a row of upturned axe heads, an exceptionally unpleasant walking surface on a pathless stretch north from Ardpatrick point. Camp, Ceann an t-Sailein, Argyll & Bute, Scotland. Quintin, thank you, I look forward to your posts, they cheer me up enormously. And love your “weight saving OCD label trimming!” I do the same, even to the point of cutting short the handle of my tooth brush, and anything else I can. 😄Cheers as you go! I’m so glad. Perhaps we can both enrol for toothbrush handle trimming therapy!? Love the images particularly of Ian and of the shed and bothy You have the focus and clarity down to a fine art. I can not ride by that mile marker without taking a photo – may be the most perfect anywhere in the world. Yes I think so it’s just perfect!